In trigger finger (TF), one of the most common causes of hand pain and disability, the flexor tendon causes painful popping or snapping as the patient flexes and extends the digit. The patient may present with a digit locked in a particular position, most often flexion, which may require gentle, passive manipulation into full extension. See the image below. Trigger finger often results in difficulty flexing or (in this case) extending metacarpophalangeal joint of involved digit. TF results from thickening of the flexor tendon within the distal aspect of the palm. [2, 3] This thickening causes abnormal gliding and locking of the tendon within the tendon sheath. Specifically, the affected tendon is caught at the edge of the first annular (A1) pulley. Children with trigger thumb rarely complain of pain. They usually are brought in for evaluation when aged 1-4 years, when the parent first notices a flexed posture of the thumb’s interphalangeal (IP) joint. These children often demonstrate bilateral fixed flexion contractures of the thumb by the time they present to the physician. By the time the child presents to the clinic, surgical treatment is already indicated in most instances. As a rule, no lab tests are needed in the diagnosis of TF. If there is a concern regarding an associated, undiagnosed condition, such as diabetes mellitus (DM), RA, or another connective tissue disease, tests such as those assessing glycosylated hemoglobin (HgbA1c), fasting blood sugar, or rheumatoid factor should be ordered. Radiography rarely is indicated in TF. Hand radiographs are performed only if abnormal pathology (eg, abnormal sesamoids, loose bodies in the MCP joint, osteoarthritic spurs on the metacarpal head, avulsion injuries of collateral ligaments) is suspected. Corticosteroid injection in the area of tendon sheath thickening is considered to be the first-line treatment of choice for TF. Custom-made splinting of the MCP joint, albeit rarely used, is another conservative treatment, used in patients who do not wish to undergo a steroid injection or as an adjuvant to injection. Typically, a custom-made splint is used to hold the MCP joint of the involved finger at 10-15° of flexion, leaving the PIP and distal interphalangeal (DIP) joints free. Trigger digits that fail to respond to 2 injections usually require surgical treatment, in the form of surgical release of the A1 pulley, under local anesthesia. During the procedure, the proximal edge of the A1 pulley is identified, and a scalpel blade is used to divide the entire A1 pulley in the midline under vision. Dissection of the nodule in the tendon is rarely indicated and may actually cause tendon weakening or rupture. With relief of triggering and friction following the release of the A1 pulley, the nodule usually regresses in size. If a percutaneous approach is favored, a pair of blunt-tipped, fine scissors is introduced through the incision, and the A1 pulley is transected. Patients can have difficulty flexing the affected digit if the tendon is caught distal to the A1 pulley, or extending the digit if the tendon is caught proximal to the pulley. The condition is very painful, especially when the locked digit snaps (releases) beyond the restriction by the use of increased force. TF has a predilection for the dominant hand, with the most commonly affected digit being the thumb, followed by the ring, long, little, and index fingers. (However, a retrospective study of 577 TFs by Schubert et al found no relation to hand dominance.  ) The involvement of several fingers is not unusual. TF occurs much less frequently in the pediatric population than in adults and develops almost exclusively in the thumb. Historically, the condition in children has been referred to as congenital trigger thumb. Evidence indicates, however, that it usually presents sometime after infancy and is thus more appropriately referred to as pediatric trigger thumb. (See Epidemiology and Presentation.) Yet, by the time medical opinion is sought, surgery is usually indicated. 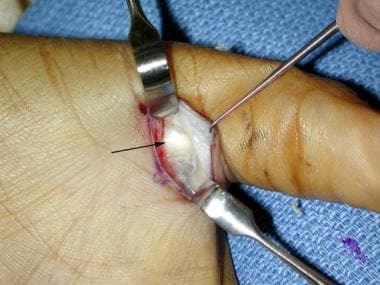 In an uncomplicated case of trigger digit, the first-line therapy is still generally agreed to be injection into the tendon sheath, with surgical release of the A1 pulley as second-line treatment. Surgery, in the form of release of the A1 pulley, became popular when splinting and/or injection therapy failed or in the presence of other pathology, such as RA, in which injection treatment proved futile or there was a risk of tendon rupture or infection. Tendon sheaths of the long flexors run from the level of the metacarpal heads (distal palmar crease, superficial; volar plate, deep) to the distal phalanges. They are attached to the underlying bones and volar plates, which prevent the tendons from bowstringing. Predictable and efficient thickenings in the fibrous flexor sheath act as pulleys, directing the sliding movements of the fingers. The two types of pulleys are annular (A) and cruciate (C). Annular pulleys are composed of single fibrous bands (ie, rings), while cruciate pulleys have two crossing fibrous bands. Flexor tendons pass within tendon sheath and beneath A1 pulley at approximately metacarpal head, beyond which they travel into digit. The A2 and A4 pulleys are vital in preventing bowstringing of the flexor tendons and must be preserved or reconstructed after any damage to them. The flexor anatomy of the thumb differs from that of the fingers. The flexor pollicis longus (FPL) tendon is a single tendon within the flexor sheath that inserts onto the base of the distal phalanx. The fibro-osseous sheath is composed of two annular pulleys (A1 and A2) that arise from the palmar plates of the MCP and interphalangeal (IP) joints, respectively. The oblique pulley, which originates from and inserts onto the proximal phalanx, is the most important pulley from a biomechanical perspective. The oblique pulley is approximately 10 mm in length, blending with a portion of the adductor pollicis insertion. The digital nerves and arteries run parallel to the tendon sheath distally. At the level of the MCP flexion crease, they lie just deep to the skin. Proximal to the A1 pulley, the radial digital nerve of the thumb crosses obliquely over the sheath. Inflamed nodule can restrict tendon from passing smoothly beneath A1 pulley. If nodule is distal to A1 pulley (as shown in this sketch), then digit may get stuck in extended position. Conversely, if nodule is proximal to A1 pulley, then patient's digit is more likely to become stuck in flexed position. When more forceful attempts are made to extend the digit, by using increased force from the finger extensors or by applying an external force (for example, by exerting force on the finger with the other hand), the digit classically snaps open with significant pain at the distal palm and into the proximal aspect of the affected digit. Less commonly, the nodule is restricted distal to the A1 pulley, resulting in difficulty flexing the digit. The etiology of TF is unknown or uncertain. It is suspected that nodule formation in the tendon, morphologic changes in the pulley, or both in combination may effect triggering, though why these changes are actually initiated remains unknown. Thus, in conclusion, the exact etiology remains unknown, but certain conditions such as diabetes mellitus (DM) or rheumatoid arthritis (RA) may predispose an individual to triggering of the digit. Sampson et al concluded that the underlying pathobiologic mechanism for triggering is fibrocartilaginous metaplasia of the pulleys due to trauma or disease. Several studies have failed to demonstrate the presence of acute or chronic inflammatory cells within the tenosynovium. The suffix -itis in the term stenosing tendovaginitis actually is a misnomer unless the condition is associated with RA or inflammatory arthritis. Septic causes of TF are secondary infections (eg, tuberculosis). A few case reports have documented rare causes of TF, including tenosynovitis that itself resulted from a Mycobacterium kansasii infection in an immunocompetent patient; triggering following the development of calcific tendonitis has been reported in a child. Such cases should invoke a high degree of suspicion. Trigger thumb (see the image below) usually occurs idiopathically, though it develops more frequently in individuals with diabetes or osteoarthritis. Trigger thumb is more likely to occur in an individual with any condition that causes diffuse proliferation of the tenosynovium, such as inflammatory arthritis, gout, or chronic infection (eg, fungus, atypical mycobacteria). This process can extend distal to the MCP joint and, when severe, cause stiffness rather than intermittent triggering. Trigger thumb. A1 pulley exposed within surgical field (arrow). Digital neurovascular bundles behind retractors. Certain people appear more prone to tenosynovitic conditions; patients with trigger thumb are more likely to develop carpal tunnel syndrome and de Quervain disease. The roles of overuse and trauma in trigger thumb are controversial, though the condition does have a predilection for the dominant hand. TF is a relatively common condition and occurs two to six times more frequently in women than in men. The prognosis in TF is very good; most patients respond to corticosteroid injection with or without associated splinting. Some cases of TF may resolve spontaneously and then reoccur without obvious correlation with treatment or exacerbating factors. Freiberg et al found a greater success rate for TF injection therapy when the treatment was used in patients in whom an examiner could palpate a discrete, rather than a diffuse, nodular consistency in the flexor sheath. Digits with a discrete, palpable nodule had a 93% success rate with a single injection of triamcinolone at 3 months' follow-up, whereas digits with a diffuse pattern had a 52% failure rate. Patients who need surgical release generally have a very good outcome. Percutaneous TF release has been reported by several authors to be safe and efficacious, with success rates of 74-94% and no complications having been found at medium-term follow-up. The procedure is advised for individuals with established primary TF who have symptoms lasting longer than 4 months or for patients in whom injection therapy has failed to relieve symptoms. It is considered a reasonable choice following 1 injection failure and actually may confer cost benefits through permanent relief. As with patient education following any local injection, patients should be told to watch for signs and symptoms of infection and bleeding. Any suggestion of infection or excessive bleeding should be reported to the physician immediately. Patients should understand that some increased tenderness may be noted at the injection site for 2-4 days, until the corticosteroid begins to have a significant therapeutic effect. If there is an inordinate amount of pain after the procedure, patients should contact the physician who performed the injection. Patients should understand that a certain amount of numbness in the digit may occur if some of the local anesthetic has come into contact with a digital nerve; however, the numbness should resolve within a matter of hours after the injection. Significant, persistent numbness should be reported to the physician who performed the injection. To minimize the risk of tendon rupture after corticosteroid injection, the patient should be advised that for a few weeks after the injection, he or she should avoid using the injected structures for excessively strenuous or forceful activity. Fam AG. Regional pain problems. Klippel JH, Dieppe PA, eds. Practical Rheumatology. London, England: Mosby; 1997. Trigger finger. Armstrong AD, Hubbard MC, eds. Essentials of Musculoskeletal Care. 5th ed. Rosemont, IL: American Academy of Orthopaedic Surgeons; 2015. Finnoff JT. Upper limb pain and dysfunction. Cifu DX, Kaelin DL, Kowalske KJ, et al, eds. Braddom's Physical Medicine and Rehabilitation. 5th ed. Philadelphia: Elsevier; 2016. 769-80. Bae DS. Pediatric trigger thumb. J Hand Surg Am. 2008 Sep. 33(7):1189-91. [Medline]. Kim HR, Lee SH. Ultrasonographic assessment of clinically diagnosed trigger fingers. Rheumatol Int. 2010 Sep. 30 (11):1455-8. [Medline]. Bamroongshawgasame T. A comparison of open and percutaneous pulley release in trigger digits. J Med Assoc Thai. 2010 Feb. 93(2):199-204. [Medline]. Will R, Lubahn J. Complications of open trigger finger release. J Hand Surg Am. 2010 Apr. 35(4):594-6. [Medline]. Schramm JM, Nguyen M, Wongworawat MD. The safety of percutaneous trigger finger release. Hand (N Y). 2008 Mar. 3 (1):44-6. [Medline]. [Full Text]. Masquijo JJ, Ferreyra A, Lanfranchi L, Torres-Gomez A, Allende V. Percutaneous trigger thumb release in children: neither effective nor safe. J Pediatr Orthop. 2014 Jul-Aug. 34 (5):534-6. [Medline]. Schubert C, Hui-Chou HG, See AP, Deune EG. Corticosteroid injection therapy for trigger finger or thumb: a retrospective review of 577 digits. Hand (N Y). 2013 Dec. 8(4):439-44. [Medline]. [Full Text]. Rodgers WB, Waters PM. Incidence of trigger digits in newborns. J Hand Surg Am. 1994 May. 19(3):364-8. [Medline]. De Smet L, Steenwerckx A, Van Ransbeeck H. The so-called congenital trigger digit: further experience. Acta Orthop Belg. 1998 Sep. 64(3):306-8. [Medline]. Li Z, Wiesler ER, Smith BP, Koman LA. Surgical treatment of pediatric trigger thumb with metacarpophalangeal hyperextension laxity. Hand (N Y). 2009 Dec. 4(4):380-4. [Medline]. [Full Text]. Marks MR, Gunther SF. Efficacy of cortisone injection in treatment of trigger fingers and thumbs. J Hand Surg Am. 1989 Jul. 14 (4):722-7. [Medline]. Breen TF. Wrist and hand. Steinberg GG, Akins CM, Baran DT, eds. Orthopaedics in Primary Care. 3rd ed. Baltimore: Lippincott Williams & Wilkins; 1999. 99-138. Brinker MR, Miller MD. The adult hand. Fundamentals of Orthopaedics. Philadelphia: WB Saunders; 1999. 196-220. Magee DJ. Forearm, wrist, and hand. Orthopedic Physical Assessment. 6th ed. St Louis: Elsevier Saunders; 2014. 429-507. Miyamoto H, Miura T, Isayama H, Masuzaki R, Koike K, Ohe T. Stiffness of the first annular pulley in normal and trigger fingers. J Hand Surg Am. 2011 Sep. 36(9):1486-91. [Medline]. Hueston JT, Wilson WF. The aetiology of trigger finger explained on the basis of intratendinous architecture. Hand. 1972 Oct. 4 (3):257-60. [Medline]. Sampson SP, Badalamente MA, Hurst LC, Seidman J. Pathobiology of the human A1 pulley in trigger finger. J Hand Surg Am. 1991 Jul. 16 (4):714-21. [Medline]. Ryzewicz M, Wolf JM. Trigger digits: principles, management, and complications. J Hand Surg Am. 2006 Jan. 31(1):135-46. [Medline]. Kumar P, Chakrabarti I. Idiopathic carpal tunnel syndrome and trigger finger: is there an association?. J Hand Surg Eur Vol. 2009 Feb. 34(1):58-9. [Medline]. Grandizio LC, Beck JD, Rutter MR, Graham J, Klena JC. The incidence of trigger digit after carpal tunnel release in diabetic and nondiabetic patients. J Hand Surg Am. 2014 Feb. 39(2):280-5. [Medline]. Freiberg A, Mulholland RS, Levine R. Nonoperative treatment of trigger fingers and thumbs. J Hand Surg Am. 1989 May. 14 (3):553-8. [Medline]. Stahl S, Kanter Y, Karnielli E. Outcome of trigger finger treatment in diabetes. J Diabetes Complications. 1997 Sep-Oct. 11(5):287-90. [Medline]. Baumgarten KM, Gerlach D, Boyer MI. Corticosteroid injection in diabetic patients with trigger finger. A prospective, randomized, controlled double-blinded study. J Bone Joint Surg Am. 2007 Dec. 89(12):2604-11. [Medline]. Moriya K, Uchiyama T, Kawaji Y. Comparison of the surgical outcomes for trigger finger and trigger thumb: preliminary results. Hand Surg. July 2005. 10(1):83-6. [Medline]. Leung OY, Ip FK, Wong TC, Wan SH. Trigger thumbs in children: results of surgical release. Hong Kong Med J. 2011 Oct. 17(5):372-5. [Medline]. Baek GH, Lee HJ. The natural history of pediatric trigger thumb: a study with a minimum of five years follow-up. Clin Orthop Surg. 2011 Jun. 3(2):157-9. [Medline]. [Full Text]. Moore JS. Flexor tendon entrapment of the digits (trigger finger and trigger thumb). J Occup Environ Med. 2000 May. 42(5):526-45. [Medline]. Moriya K, Uchiyama T, Kouda H, Kawaji Y. Acromegaly as a cause of trigger finger. Scand J Plast Reconstr Surg Hand Surg. 2009. 43(4):236-8. [Medline]. Drossos K, Remmelink M, Nagy N, de Maertelaer V, Pasteels JL, Schuind F. Correlations between clinical presentations of adult trigger digits and histologic aspects of the A1 pulley. J Hand Surg Am. 2009 Oct. 34(8):1429-35. [Medline]. Tung WL, Kuo LC, Lai KY, Jou IM, Sun YN, Su FC. Quantitative evidence of kinematics and functional differences in different graded trigger fingers. Clin Biomech (Bristol, Avon). 2010 Jul. 25 (6):535-40. [Medline]. Rhoades CE, Gelberman RH, Manjarris JF. Stenosing tenosynovitis of the fingers and thumb. Results of a prospective trial of steroid injection and splinting. Clin Orthop Relat Res. 1984 Nov. 236-8. [Medline]. Hoppenfeld S, de Boer P, Buckley R. Surgical Exposures in Orthopaedics: The Anatomic Approach. 5th ed. Philadelphia: Wolters Kluwer; 2017. [Guideline] Huisstede BM, Hoogvliet P, Coert JH, Fridén J, European HANDGUIDE Group. Multidisciplinary consensus guideline for managing trigger finger: results from the European HANDGUIDE Study. Phys Ther. 2014 Oct. 94 (10):1421-33. [Medline]. Patel MR, Bassini L. Trigger fingers and thumb: when to splint, inject, or operate. J Hand Surg Am. 1992 Jan. 17(1):110-3. [Medline]. Baek GH, Kim JH, Chung MS, Kang SB, Lee YH, Gong HS. The natural history of pediatric trigger thumb. J Bone Joint Surg Am. 2008 May. 90(5):980-5. [Medline]. Lee ZL, Chang CH, Yang WY, Hung SS, Shih CH. Extension splint for trigger thumb in children. J Pediatr Orthop. 2006 Nov-Dec. 26 (6):785-7. [Medline]. Ogino T. Trigger thumb in children: current recommendations for treatment. J Hand Surg Am. 2008 Jul-Aug. 33(6):982-4. [Medline]. Sato ES, Gomes Dos Santos JB, Belloti JC, Albertoni WM, Faloppa F. Treatment of trigger finger: randomized clinical trial comparing the methods of corticosteroid injection, percutaneous release and open surgery. Rheumatology (Oxford). 2012 Jan. 51(1):93-9. [Medline]. Cardon LJ, Ezaki M, Carter PR. Trigger finger in children. J Hand Surg Am. 1999 Nov. 24 (6):1156-61. [Medline]. Ashford JS, Bidic SM. Evaluation of pediatric trigger thumb in the Hispanic population at a southwest urban medical center. Plast Reconstr Surg. 2009 Oct. 124(4):1221-4. [Medline]. Feldon P, Terrono AL, Nalebuff EA, Millender LH. Rheumatoid arthritis and other connective tissue diseases. Wolfe SW, Hotchkiss RN, Pederson WC, et al, eds. Green's Operative Hand Surgery. 7th ed. Philadelphia: Elsevier; 2017. Vol 2: 1834-903. Peters-Veluthamaningal C, Winters JC, Groenier KH, Jong BM. Corticosteroid injections effective for trigger finger in adults in general practice: a double-blinded randomised placebo controlled trial. Ann Rheum Dis. 2008 Sep. 67 (9):1262-6. [Medline]. Nimigan AS, Ross DC, Gan BS. Steroid injections in the management of trigger fingers. Am J Phys Med Rehabil. 2006 Jan. 85(1):36-43. [Medline]. Fleisch SB, Spindler KP, Lee DH. Corticosteroid injections in the treatment of trigger finger: a level I and II systematic review. J Am Acad Orthop Surg. 2007 Mar. 15(3):166-71. [Medline]. Geiringer SR. Tendon sheath and insertion injections. Lennard TA, ed. Physiatric Procedures in Clinical Practice. Philadelphia: Hanley & Belfus; 1995. 44-8. Kerrigan CL, Stanwix MG. Using evidence to minimize the cost of trigger finger care. J Hand Surg Am. Jul-Aug 2009. 34;(6):997-1005. Ring D, Lozano-Calderón S, Shin R, Bastian P, Mudgal C, Jupiter J. A prospective randomized controlled trial of injection of dexamethasone versus triamcinolone for idiopathic trigger finger. J Hand Surg Am. 2008 Apr. 33 (4):516-22; discussion 523-4. [Medline]. Chambers RG Jr. Corticosteroid injections for trigger finger. Am Fam Physician. 2009 Sep 1. 80(5):454. [Medline]. Mol MF, Neuhaus V, Becker SJ, Jupiter JB, Mudgal C, Ring D. Resolution and recurrence rates of idiopathic trigger finger after corticosteroid injection. Hand (N Y). 2013 Jun. 8(2):183-90. [Medline]. [Full Text]. Rozental TD, Zurakowski D, Blazar PE. Trigger finger: prognostic indicators of recurrence following corticosteroid injection. J Bone Joint Surg Am. 2008 Aug. 90(8):1665-72. [Medline]. Carlson CS Jr, Curtis RM. Steroid injection for flexor tenosynovitis. J Hand Surg Am. 1984 Mar. 9 (2):286-7. [Medline]. Godey SK, Bhatti WA, Watson JS, Bayat A. A technique for accurate and safe injection of steroid in trigger digits using ultrasound guidance. Acta Orthop Belg. 2006 Oct. 72 (5):633-4. [Medline]. Lee DH, Han SB, Park JW, Lee SH, Kim KW, Jeong WK. Sonographically guided tendon sheath injections are more accurate than blind injections: implications for trigger finger treatment. J Ultrasound Med. 2011 Feb. 30(2):197-203. [Medline]. Jianmongkol S, Kosuwon W, Thammaroj T. Intra-tendon sheath injection for trigger finger: the randomized controlled trial. Hand Surg. 2007. 12(2):79-82. [Medline]. Sibbitt WL Jr, Michael AA, Poole JL, Chavez-Chiang NR, Delea SL, Bankhurst AD. Nerve blocks at the wrist for painful injections of the palm. J Clin Rheumatol. 2011 Jun. 17(4):173-8. [Medline]. Anderson B, Kaye S. Treatment of flexor tenosynovitis of the hand ('trigger finger') with corticosteroids. A prospective study of the response to local injection. Arch Intern Med. 1991 Jan. 151(1):153-6. [Medline]. Pataradool K, Buranapuntaruk T. Proximal phalanx injection for trigger finger: randomized controlled trial. Hand Surg. 2011. 16(3):313-7. [Medline]. Akhtar S, Bradley MJ, Quinton DN, Burke FD. Management and referral for trigger finger/thumb. BMJ. 2005 Jul 2. 331(7507):30-3. [Medline]. [Full Text]. Taras JS, Raphael JS, Pan WT, Movagharnia F, Sotereanos DG. Corticosteroid injections for trigger digits: is intrasheath injection necessary?. J Hand Surg Am. 1998 Jul. 23(4):717-22. [Medline]. Shinomiya R, Sunagawa T, Nakashima Y, Yoshizuka M, Adachi N. Impact of Corticosteroid Injection Site on the Treatment Success Rate of Trigger Finger: A Prospective Study Comparing Ultrasound-Guided True Intra-Sheath and True Extra-Sheath Injections. Ultrasound Med Biol. 2016 Sep. 42 (9):2203-8. [Medline]. Colbourn J, Heath N, Manary S, Pacifico D. Effectiveness of splinting for the treatment of trigger finger. J Hand Ther. 2008 Oct-Dec. 21(4):336-43. [Medline]. Valdes K. A retrospective review to determine the long-term efficacy of orthotic devices for trigger finger. J Hand Ther. 2012 Jan-Mar. 25(1):89-95; quiz 96. [Medline]. Chao M, Wu S, Yan T. The effect of miniscalpel-needle versus steroid injection for trigger thumb release. J Hand Surg Eur Vol. 2009 Aug. 34(4):522-5. [Medline]. Lange-Riess D, Schuh R, Hönle W, Schuh A. Long-term results of surgical release of trigger finger and trigger thumb in adults. Arch Orthop Trauma Surg. 2009 Dec. 129(12):1617-9. [Medline]. Al-Qattan MM. Trigger fingers requiring simultaneous division of the A1 pulley and the proximal part of the A2 pulley. J Hand Surg Eur Vol. Oct 2007. 32(5):521-3. [Medline]. Rojo-Manaute JM, Rodríguez-Maruri G, Capa-Grasa A, Chana-Rodríguez F, Soto Mdel V, Martín JV. Sonographically guided intrasheath percutaneous release of the first annular pulley for trigger digits, part 1: clinical efficacy and safety. J Ultrasound Med. 2012 Mar. 31(3):417-24. [Medline]. Hazani R, Whitney RD, Redstone J, Chowdhry S, Wilhelmi BJ. Safe treatment of trigger thumb with longitudinal anatomic landmarks. Eplasty. 2010 Sep 15. 10:[Medline]. [Full Text]. Boretto J, Alfie V, Donndorff A, Gallucci G, DE Carli P. A prospective clinical study of the A1 pulley in trigger thumbs. J Hand Surg Eur Vol. 2008 Jun. 33 (3):260-5. [Medline]. Gulabi D, Cecen GS, Bekler HI, Saglam F, Tanju N. A study of 60 patients with percutaneous trigger finger releases: clinical and ultrasonographic findings. J Hand Surg Eur Vol. 2014 Sep. 39 (7):699-703. [Medline]. Migaud H, Fontaine C, Brazier J, Pierchon F, Duquennoy A. [Kapandji enlargement plasty of A1 pulley. Results in 15 primary trigger fingers with a 5 year (2-8 years) follow-up]. Ann Chir Main Memb Super. 1996. 15 (1):37-41; discussion 42. [Medline]. Fitzgerald BT, Hofmeister EP, Fan RA, Thompson MA. Delayed flexor digitorum superficialis and profundus ruptures in a trigger finger after a steroid injection: a case report. J Hand Surg Am. 2005 May. 30(3):479-82. [Medline]. 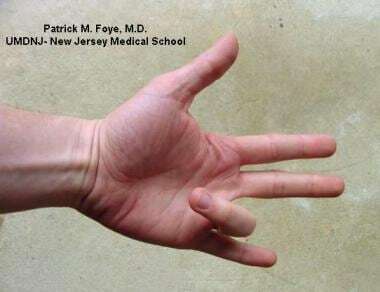 Peters-Veluthamaningal C, van der Windt DA, Winters JC, Meyboom-de Jong B. Corticosteroid injection for trigger finger in adults. Cochrane Database Syst Rev. 2009 Jan 21. CD005617. [Medline]. Introduction of needle into tendon sheath at 45° angle to palm for injection treatment. Movement of needle with flexion of digit confirms correct positioning of needle for injection treatment. Incision marked out in distal palmar crease for surgical division of A1 pulley. A1 pulley is sectioned by using blunt-tipped, fine scissors, keeping strictly in midline. Note digit being held in hyperextended position by assistant to displace neurovascular bundles away from midline. Incision for trigger thumb release placed in MP flexion crease, centered over flexor tendon nodule. Trigger thumb. A1 pulley has been released; flexor pollicis longus tendon now exposed. Retractors have been removed to demonstrate proximity of neurovascular bundles (arrows) to tendon. The authors and editors of Medscape Reference would like to thank medical students Dena Abdelshahed and Leia Rispoli, plus Drs. Debra Ibrahim, Evish Kamrava, Jason Lee, Cyrus Kao, and Dev Sinha, for their help in previous revisions of a source article.